The model - news of this model was received from BusByBono on 17th May 2016 and it was released in Hong Kong on 1st June along with a second model, a Kowloon Motor Bus Dennis Dart with Northern Counties Paladin bodywork. 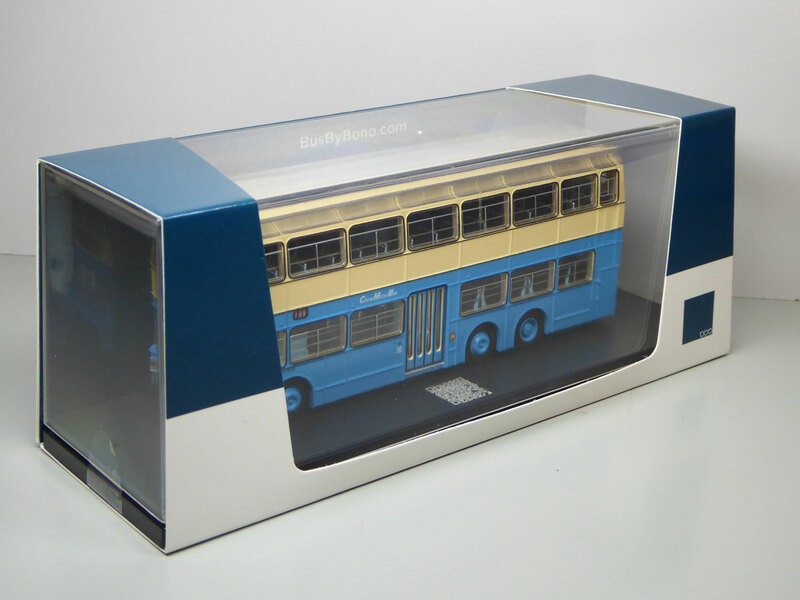 The models are only available from BusByBono using their website - they also have a Facebook page. "These models, scale 1:76, are manufactured with limited editions of 500 units each. Instead of a paper printed certificate provided by most of the other manufacturers in this industry, each of our bus comes with an individual metal etched QR code, 1 underneath the bus and 1 sat on the base of display. With the use of unique QR code, it is truly a limited edition of the said quantity. They are priced at retail online HK$590 each. 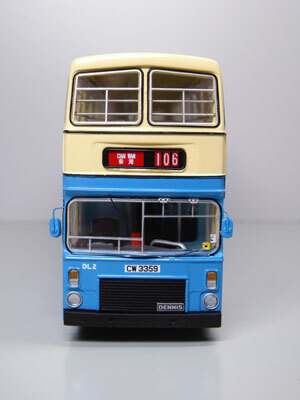 The bus models are made of ABS plastic injection to finest details and strict quality inspection." 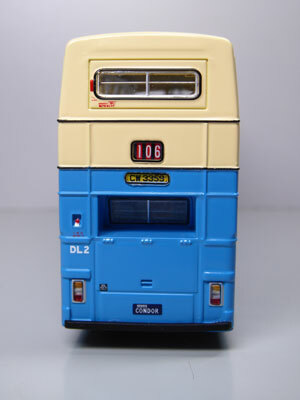 News of a model not previously issued is always very welcome, so the announcement of the release of the unique China Motor Bus Dennis Condor DL2 was somewhat tempered by the fact that it wasn't diecast or resin, but ABS injection, or in lay-man terms, plastic! The press releases from BusByBono claims the quality of this type of material is far superior than most resin or die-cast models so I contacted Rick of BusByBono and my model arrived a week after dispatch. 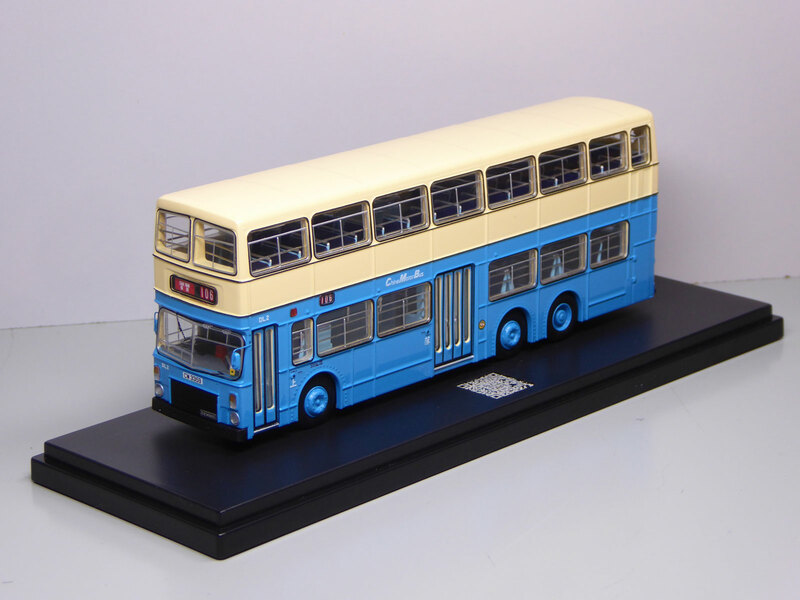 The model comes in the usual plastic display case and is affixed to the plinth by two screws. The display case has a simple card sleeve. The display case is packed in a plain white outer cardboard box and is packed with polystyrene/foam inserts for protection. Upon removing the model from the plinth, the most noticeable difference is its weight. Placing it on the kitchen scales it records a weight of 96 grams - for comparison the recently released Model 1 Rickshaw Bus Enviro500 weighs 245 grams and a Buses Model 11-metre Olympian weighs 280 grams! It is a single piece 'casting' with a separate base, which has a QR barcode on it giving confirmation of the limited edition quantity and the individual number - such a QR barcode is also featured on the plinth. There is no other detail on the base. Overall impressions of the model are very good and in my opinion it captures the general appearance of the prototype well. The colours appear accurate and the black pinstripes and window surrounds are precise. 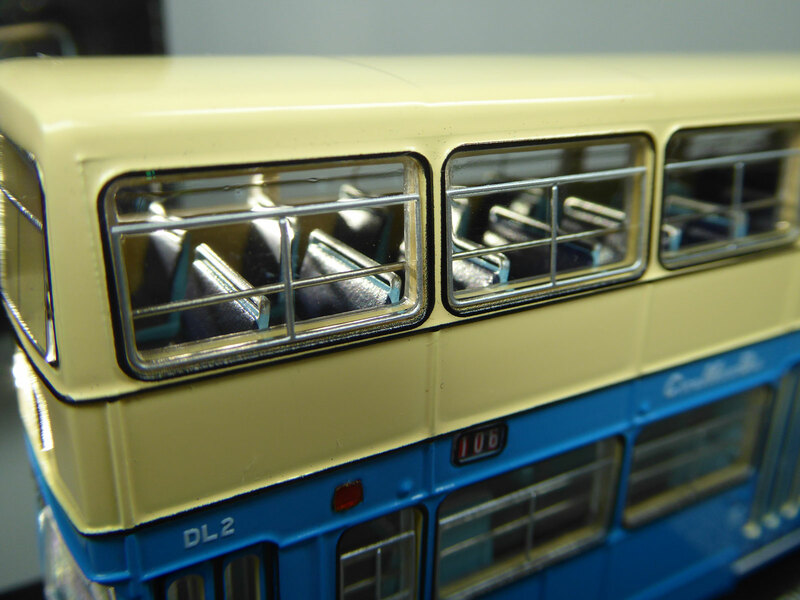 The interior is well detailed, in particular the seats and the separate metal grab poles and window rails. The photographs below hopefully will show the various aspects of the model. 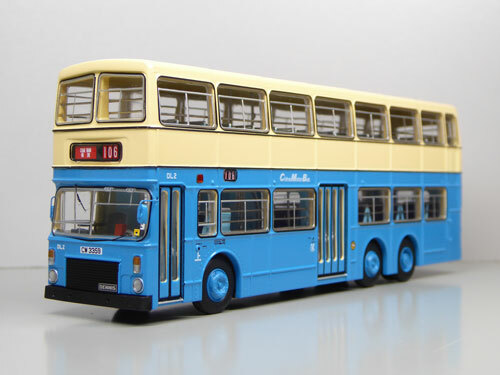 To summarise, I believe the model is very well detailed and it is difficult to find any faults with it. 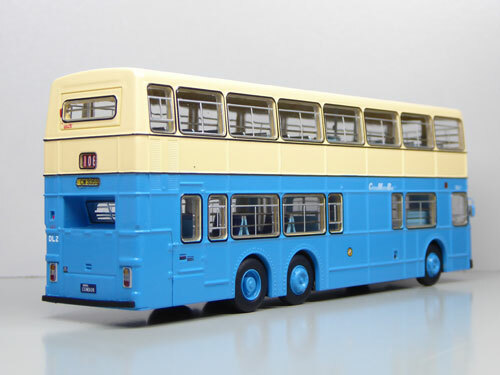 With a retail price of HK$590, it is not cheap and coupled with its lightness, it may appear to some that you are not getting your moneys' worth - but if you are after an otherwise unreleased model and it is going to sit in a display case, so what! The bus - China Motor Bus trialled six three-axle buses in 1981/82 - two being MCW Metrobuses (ML 1 & 2), two were Ailsa-Volvos (AL1 & 2) and the final two were Dennis Condors (DL1 & 2). Unlike the other two pairs, the Condors featured differing bodywork - DL1 having Duple Metsec and DL2 Alexander 'RX' type. Both arrived in 1982 with DL2 being registered on 13th July. 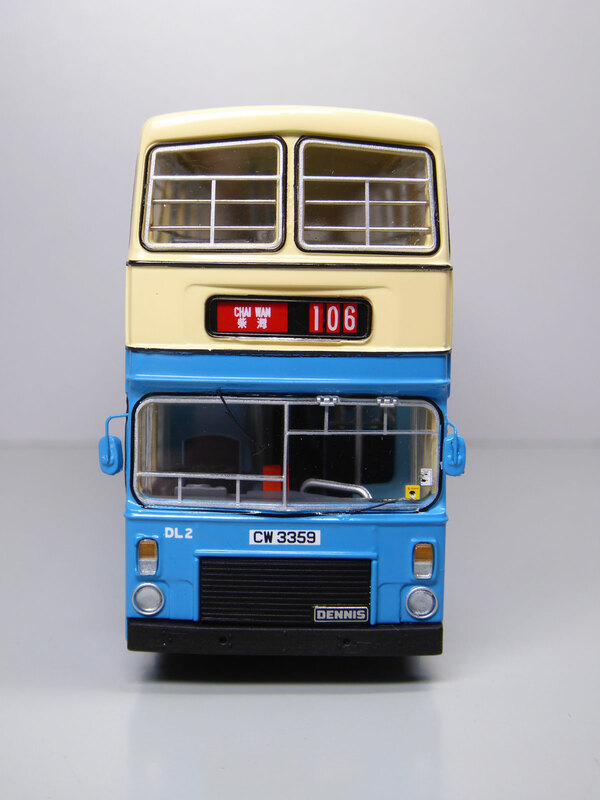 It was transferred to New World First Bus on 1st September 1998 and was withdrawn on 23rd April 1999. It was subsequently acquired for private preservation and the following page in the section of the site gives further details.